World Superbike Race 2 Sunday at Buriram. Jonathan on the podium….again ! Another great win for the king of this circuit Johnathan Rea of Northern Ireland, 5 wins and a second in the races held here in the last three years. He charged off into the lead from the off followed by Marco Melandri and Chaz Davies who was unlucky to fall on the second lap. The drama wasn’t over however as Italian rider Savadori’s engine blew spewing oil onto his rear wheel causing him to crash out and the red flag to come out to stop the race due to the dangerous amount of oil on the track. Credit again must go to the race control team at BRIC for seeing the danger involved and rectifying the problem before the race was re-started again to run the remaining 16 laps. 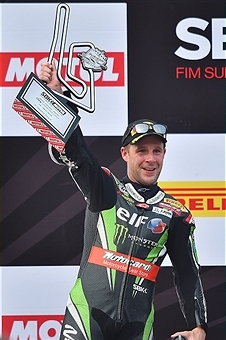 It was business as usual for Rea to lead with a good battle with Melandri and his teammate Sykes who took second place from Melandri on the last lap. Alex Lowes took 4th, Torres 5th and with an inspired ride from Davies at the re-start, a deserved 6th position. The official attendance was quoted as 80,379 but looking at the packed grandstands and bearing in mind the number of corporate guests, the presence of the riders and support crews, Buriram city was rewarded with over 81,000 visitors over the weekend .Well done again Chang International Circuit Buriram. Jonathan Rea taking a bend.